Betty J. Geis is an Adjunct Professor in Sociology and Philosophy for the Humanities Department of Seward County Community College. She has spent nearly four decades in the field of education, and as a classroom educator, she has taught elementary, secondary and college students. She is a weekly column writer in Inspiration Point and Cedar Vale Lookout, and she also writes for the Canton Times. In addition, Ms. Geis has published reviews for several textbook companies. She has previously served Cedar Vale Unified School District 285 as a school counselor, and in her former role, she excelled in classroom and individual counseling, inter-distance learning, and monitoring transcripts and health records. Ms. Geis retired in 2007 from the public school level of education. Ms. Geis is currently responsible for teaching introduction to philosophy and sociology, and providing instruction to students throughout all seasons. She also offers tutoring to those she teaches. She has become recognized for her exceptional skills over the course of her career, and she continues to strive for excellence. Ms. Geis has been nominated for the Teacher of the Year Award, and she was honored as the Young Woman of the Year, and she has also received a Service Award from the School Board at Okeene Public Schools, and been nominated for induction into the Outstanding Young Women of America. 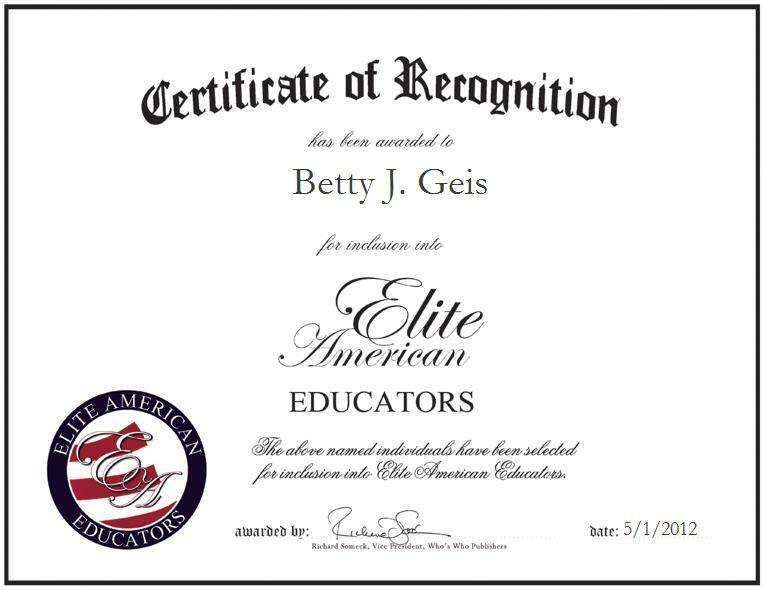 In 2011, Ms. Geis was honored as a Professional of the Year in Higher Education by Cambridge Who’s Who. She attributes her success to diversified teaching methods, setting an example for the actions she would like to see her students replicate, and peppering her lessons with humor.